ALDEGRIN (ADALGRIN, ALDEGRIN), after retiring from a life as a knight, St. Aldegrin received monastic tonsure at the Abbey of St. Peter of Baume-les-Messieurs (abbaye Saint-Pierre de Baume-les-Messieurs — Baume Abbey) in the French Jura, where he was a spiritual child of St. Odo of Cluny (18th November). St. Aldegrin spent his last years as a hermit not far from the Abbey. He reposed 939. ALEXANDER, there is no contemporaneous information on St. Alexander extant. However, it is known he was a Bishop of Verona in the Veneto region of Italy, most likely the twenty-first, and it seems he flourished in the early part of the eighth century. ARETIUS (ARECIUS, AREGIUS), and DACIAN, (Date Unknown), Roman martyrs who were buried in the catacombs on the Appian Way, of whom nothing further is known. BREACA, the limited amount of information extant on St. Breaca is pious legend based upon a now lost mediaeval hagiography. It appears she was a native of Ireland and probably a disciple of either (or both) SS. Brigid (1st February) or Patrick (17th March). She crossed over to Cornwall, England with several companions and lived in solitude and great sanctity. Several of the group are said to have been martyred by the local ruler Tewder or Theodoric. St. Breaca reposed circa late fifth or early sixth century. BURIANA, St. Buriana was one of many Irish saints who migrated to Cornwall, England to spread the Gospel, and, as is the case with many of her contemporaries, little in the way of reliable information on her life is still extant. She is said to have lived as an anchoress at the place now known as St. Buryan, near Penzance in Cornwall, during the sixth century. CLATEUS, a very early Bishop of Brescia, martyred circa 64, in the persecutions of Christians during the reign of the Emperor Nero (r. 54–68). No further information is extant. CROIDAN, MEDAN, and DEGAN, (Sixth Century), these saints were disciples of St. Petroc (vide infra), at his monastery in Bodmin in Cornwall. Nothing else is known of their lives. The opening of St Luke's Gospel in the Lindisfarne Gospels. British Library Online Exhibit: Folio 139 recto. EADFRITH, St. Eadfrith succeeded St. Edbert (6th May) as eighth Bishop of Lindisfarne, and is generally believed to have been the scribe and artist responsible for the the Lindisfarne Gospels . St. Eadfrith reposed in 721. ELSIAR, a monk at the Abbey of Saint Sabinus of the Lavedan (Abbaye de Saint-Savin-en-Lavedan), in Hautes-Pyrénées, France, on the Spanish/French border. St. Elsiar reposed circa 1050. NENNOC (NENNOCHA, NINNOC), one of the many daughters of St. Brychan of Brycheiniog (6th April) and a nun in Britain. St. Nennoc accompanied St. Germanus of Auxerre (31st July) on his return to Gaul, and it is believed St. Nennoc served as Abbess of one or more monasteries in Brittany. St. Nennoc reposed circa 467. OPTATUS of MILEVIS, a late fourth century Bishop of Milevis, Numidia (present-day Algeria), and survivor of the Diocletianic Persecution, as well as Julian the Apostate’s (r. 361–363) persecution of Christians. A fervent foe of Donatist heresy, St. Optatus’ work Against the Donatists was praised by his contemporaries, and an important resource for theologians to this day. St. Optatus reposed circa 387. PETROC (PETROCK, PEDROG, PERREUX), St. Petroc has been called ‘The Captain of Cornish Saints’ by Anglican Historian Thomas Fuller, and is one of Britain’s most illustrious saints. A native of Wales, he went to Ireland where he is believed to have studied under St. Kevin (3rd June). St. Petroc then went to Cornwall in England where he founded a monastery at the place now known as Padstow (Petrocstow), and a second one at Bodmin. He reposed there circa 594; later some of his relics were translated to Brittany where he is known as St. Perreux. QUIRINUS, a Bishop of Sisak, in present-day central Croatia. Who was tortured and then martyred towards the end of the Diocletianic Persecution circa 308. Whilst imprisoned, St. Quirinus converted his gaoler. The authentic Acts of his martyrdom are contained in T. Ruinart’s Acta primorum martyrum sincera et selecta , as is a hymn composed in his honour by Prudentius. QUIRINUS, (Date Unknown), martyred at Tivoli near Rome. No further information is extant. 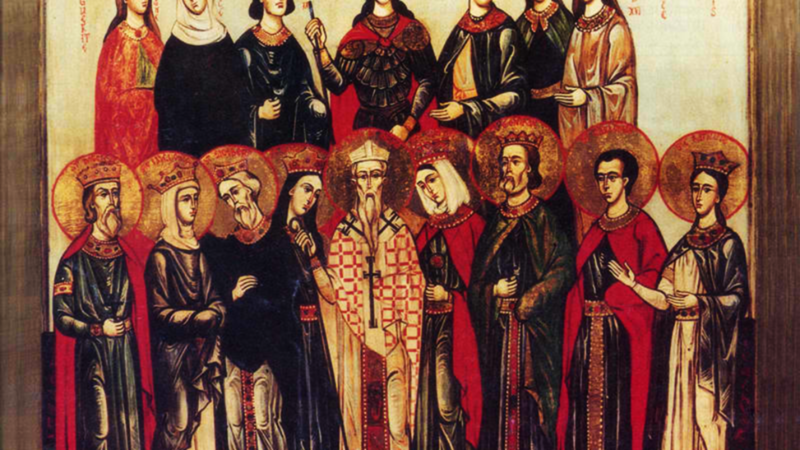 RUTILUS and COMPANIONS, (Date Unknown), an unknown number of martyrs at Savaria Pannonia, present-day Szombathely, Hungary. Aside from St. Rutilus’ name, and the location of their martyrdom there is no information extant. SATURNINA, (Date Unknown), according to pious tradition, which is of questionable veracity, St. Saturnina was a German maiden who was murdered whilst defending her virtue, near Arras in Gaul.